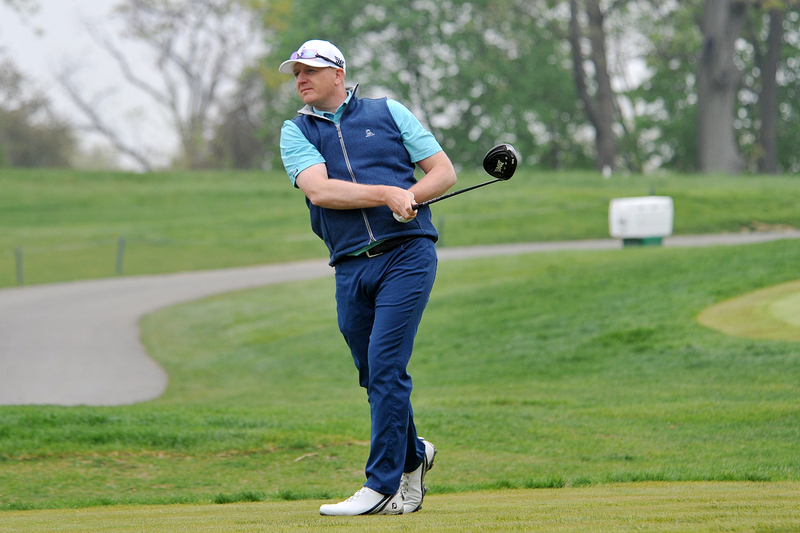 It wasn’t the result Grant Sturgeon wanted, but it was a strong showing for the PGA Head Professional at Arcola Country Club in his first year competing in the 97th NJSGA Open at Metedeconk National Golf Club this week. Sturgeon, 39, who is in his first year in the Section at Arcola Country Club, entered the day one-stroke back from adding another major in New Jersey to his list. The 2017 Lincoln Charity Clambake winner was the solo leader through 10 holes after a long birdie attempt dropped to put him at 3-over overall. But a missed par putt on the par-5 12th in addition to a three putt on No. 13 dropped Sturgeon two strokes back. He was unable to regain his footing on the remaining fives holes, finishing with a final round 75 and a 5-over overall finish. Luke Graboyes, an amateur from Watchung Valley, birdied holes 15 and 16 to pull a stroke ahead of Sturgeon for the victory. Sturgeon teeing off on the par-5 12th. Frank Esposito, a two-time State Open winner, finished as the second low professional in a tie for sixth overall at 9-over. Sturgeon and Esposito will retain their spots as No. 1 and 2 in the OMEGA Player of the Year race halfway through the season. Metedeconk was another unfamiliar setting for Sturgeon, who only played a handful of courses in New Jersey before joining the Section. He played in a pro am at the course on Monday as a practice round leading up to the event. At the beginning of his final round, Sturgeon birdied his first hole to earn a share of the lead with 17-year-old Brendan Hansen, an amateur who was vying to be the youngest State Open winner. The weather at Metedeconk reached nearly 100 degrees throughout the final round, though Sturgeon said it did not impact his play down the stretch.